After an evening of hopping around the West Village I was in serious need of an espresso and some sugar. Luckily Corrado bakery happens to be right near Kettle of Fish and those dreamy sweets in the window were calling my name. I ordered a double espresso, some macaroons and threw in a cupcake at the end just for good measure. The espresso was excellent but I’m still a little on the fence about the sweets. The Red Velvet cupcake was good. 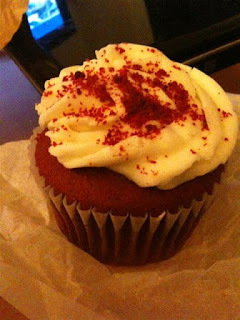 The frosting was more of a butter cream than the usual cream cheese and the cake was tasty. However the cupcake was cold. It was almost as if the pastries had been sitting in a chilled display case. The coldness made the cake very dense and the true flavors really were numbed by the temperature. The same was true for the macaroons. These too were much to cold to enjoy the usual flaky texture of the treat. 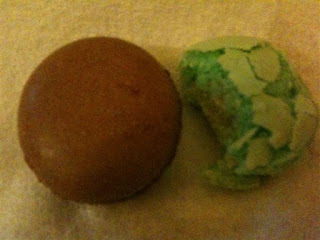 I found the Pistachio and Strawberry fillings to be overly sweet but the Coffee Macaroon was spot on. So the final verdict is mixed. Cold pastries really don’t make the cut but the espresso and coffee macaroon were so good it makes me think. Stick with coffee centered items here and I think you’ll enjoy yourself. Then head over to Rocco’s for your sweet fix.